Spring is here. I know because I saw an American robin — harbinger of spring in the Midwest — hopping around the yard. It’s an uncommon sight in the Valley, for sure, but an encouragement after such a feisty Rio Grande Valley winter. In the plant kingdom, lots of fun things are beginning to happen, too, with the change in weather and return of the humidity. Pink mint, one of the Valley’s announcements of spring, is popping out its soft-textured leaves and tiny pink blossoms. Up close, or photographed and enlarged on a computer monitor, the wee blooms look like miniature pink and white-speckled orchids. 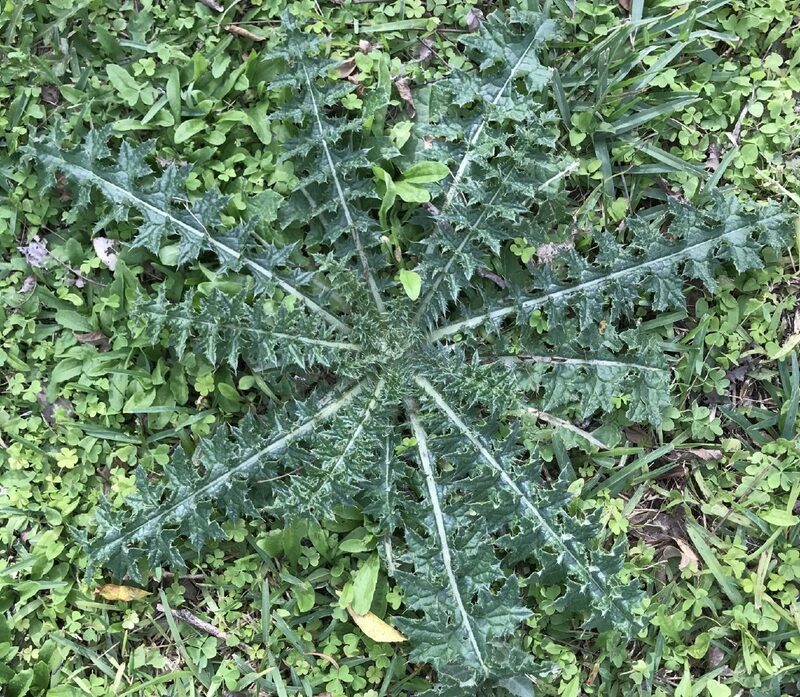 In another part of your yard, flat-to-the-ground large rosettes of Texas thistle (Cirsium texanum) might be taking shape. If you find them, flag one or two so you don’t mow them down once they begin growing upwards. 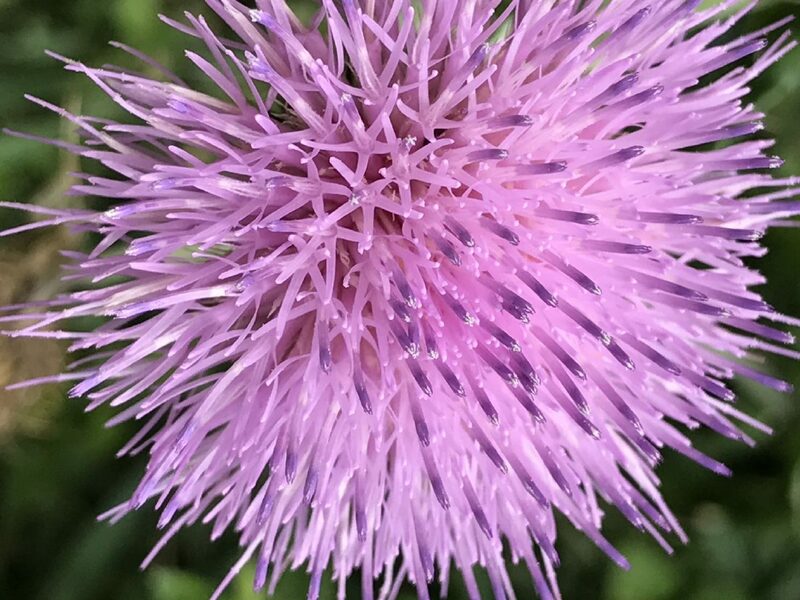 These are not weeds, Texas thistle is a native plant that can benefit the habitat. If you have the patience, it can be a fun project as you wait for the flowers to develop. can reach 2 feet in diameter or larger. Each leaf can be as long as 18 inches. The leaf margins are deeply lobed and each lobe ends in a needle-sharp spine. Soon, a stalk will begin to appear from the center. The flower stalks can grow to 5 feet tall and produce multiple blooms through late spring and into the summer. The pom-pom-like flowers range from pink to lavender and provide nectar for bees and butterflies. 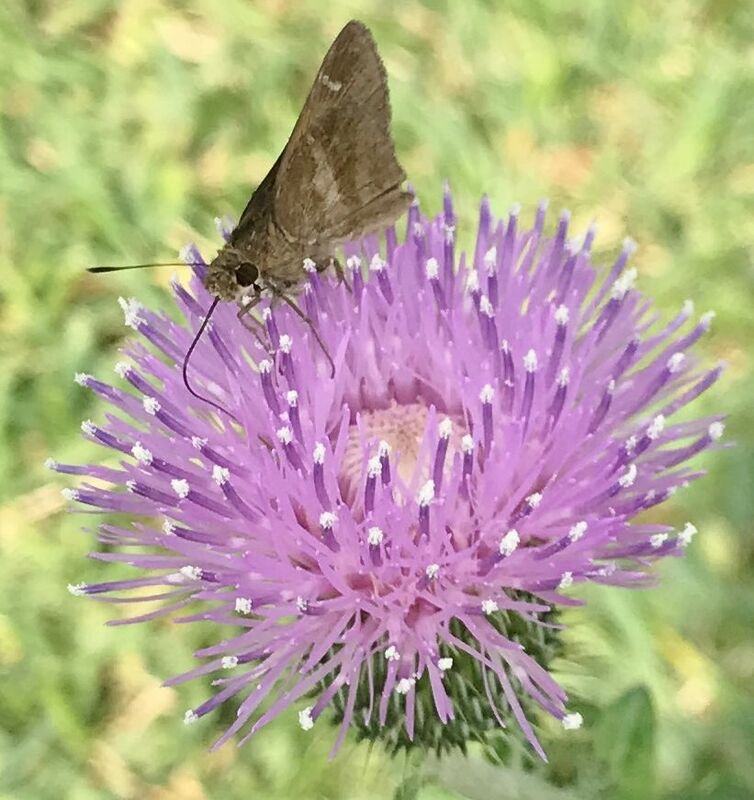 Texas thistle is one of the larval plants for the painted lady butterfly. Perhaps you’ll find the caterpillars munching away on the leaves on a warm, sunny day. Later, after the flowers are spent, the seeds can be collected and shared with groups that work with native habitat preservation. Seeds also are eaten by many different birds and insects. If allowed to self-distribute, white fluff will carry seeds to wherever the wind carries them. Small net wedding-favor bags can be tied onto the plant, encapsulating the seed heads to prevent seed distribution and to aid in seed collection.